Leuka is a charity that supports life-saving research into the causes and treatment of leukaemia and other blood cancers. Funding from dedicated charities such as Leuka provides an important source of support which enables high-quality research programmes here at Imperial to develop and progress. Lymphocytes are immune cells designed to recognise and fight infections, as well as to seek and destroy cancer cells. In order to create the diversity required to recognise and kill all possible infections, lymphocytes undergo an elaborate diversification process involving changes to genes, such as rearrangement, mutation and selection. Sometimes, diversification can produce lymphocytes that mistake the body’s own cells (self-cells) as invaders. To prevent such lymphocytes from killing self-cells, which would result in the immune system attacking its own healthy tissues (autoimmunity), another elaborate process has evolved that either kills these autoreactive lymphocytes, or keeps them in check through regulation. Together these diversification and regulatory processes allow lymphocytes to distinguish between harmful infections and the body’s own vital cells, involving many different genes. Defects in these genes, called mutations, can lead to reduced immunity, autoimmunity or uncontrolled reproduction of lymphocytes resulting in cancerous immune cells (lymphoma). By using cutting-edge techniques in gene sequencing, particularly in surveying genes for mutations in patients who have autoimmunity, we have identified new pathways for immune regulation. One of the genes we have identified is BACH2 (recently accepted for publication in Nature Immunology). BACH2 is important in lymphocyte development, survival and proliferation. It interacts with another regulator gene called BCL6, although we don’t fully understand the details of these pathways. We will use the funding from Leuka to further investigate how several BACH2 mutations, identified in patients with immunodeficiency disorders, affect the behaviour of human lymphocytes, and how BACH2 and BCL6 interact. In particular, we are using a novel technique called CRISPR to introduce the mutations into cell lines, which can be grown and manipulated in the laboratory. These cell lines can then be used to understand how these mutations lead to aberrant lymphocyte function, evaluate whether the patients are at increased risk of developing lymphomas and investigate how BACH2 and BCL6 interact with each other. Finally, we will use these cell lines to assess whether any treatments can overcome the defects and reverse the cellular effects that we have detected. Dr Nichola Cooper is Consultant Haematologist at Imperial College Healthcare NHS Trust. Her clinical and laboratory research group focuses on immune haematology, in particular immune thrombocytopenia. Dr Andy Porter is a Reader in heamatology at the Department of Medicine at Imperial. His research ranges from the use of gene targeting to study basic problems in cell biology to the role of DNA repair proteins in gene targeting and DNA double-strand break repair. Within the fourth year of my postdoctoral fellowship in the United States, I accepted the role of Head of the Molecular Genetics lab at Imperial Molecular Pathology Laboratories in Hammersmith Hospital. However I could not transfer the Special Fellowship grant that I had from the Leukaemia and Lymphoma Society to Imperial College London. Having moved to the new position, I was still keen to continue the research into leukaemia that I had done during my postdoctoral training but I did not have the funds to start. I received generous funding from The Friends of Hammersmith Hospital, which helped me to start purchasing the reagents and tools I needed for my research. This project looked at the applications of a genetics-based screen to identify the activated signalling pathways essential for the survival of acute myeloid leukaemia (AML) cells. In order to continue this project I required further funds, mainly for technical assistance. Fortunately, Leuka approved my funding application, which allowed me to recruit a passionate young researcher who is helping me with this work. We have been able to establish the first phase of this genetics-based screen, and perform the experiments for a few AML patients. I greatly appreciate this fund as it helped to open a new line of leukaemia investigation at Imperial and made it possible for me to transfer the knowledge and skills that I developed during my fellowship training to Hammersmith Hospital, where I did my PhD and first learnt about leukaemia research. 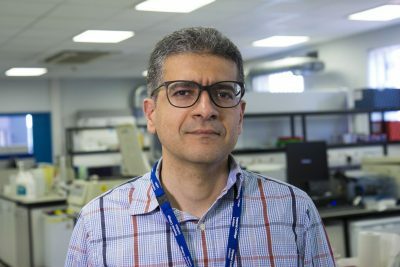 Dr Jamshid Khorashad is a molecular biology consultant scientist and Head of the Molecular Genetics lab at Imperial Molecular Pathology Laboratories in Hammersmith Hospital. Out of the four main types of leukaemia, Chronic Myeloid Leukaemia (CML) is perhaps the only type from which affected individuals can be cured and return to live their normal life expectancies. This is thanks to the drug Imatinib, a targeted therapy which works by specifically eliminating the cancer-causing cells, without harming non-cancer causing cells. The survival rate of this therapy is more than 85%. Affected individuals are considered cured provided they continue taking the drug once a day indefinitely, and that the leukaemia-causing cells do not return. As the relationship between the affected individual and the drug is daily and indefinite, they need to be regularly monitored for the occurrence of residual leukaemia-causing cells, which, if detected, would cause the disease to come back. 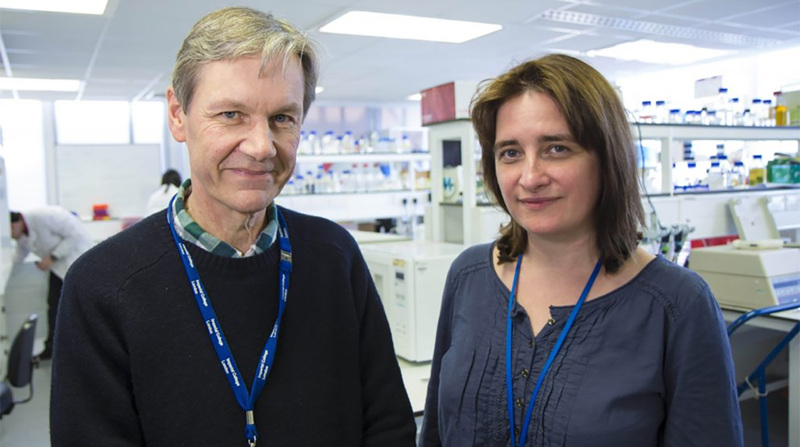 Our lab is dedicated to studying the reason why leukaemia-causing cells come back. We are also committed to utilising state-of-the-art methodologies that provide the most sensitive methods for monitoring these patients, and detecting the cancer causing cells as early as possible to direct adequate clinical intervention. In this endeavour, the funding received from Leuka allowed us to acquire a vital piece of equipment, the RainDrop dPCR – the latest development in the field of molecular diagnostics. Using this equipment, scientists in our laboratory have been quantifying residual leukaemia-causing cells in blood samples collected from individuals enrolled in clinical trials. This way, we can test for the possibility of withdrawing the drug from the patients’ daily routine, provided they have no trace of detectable leukaemia-causing cells in their blood for a considerable period of time. The aim here is to establish a correlation between early detection of leukaemia-causing cells and the relapse of the affected individuals. The ambition of these studies is to work towards improving the quality of life of affected individuals, in addition to reducing the economic burden on the NHS; which spends large sums of money to ensure the treatment is available for those who need it. 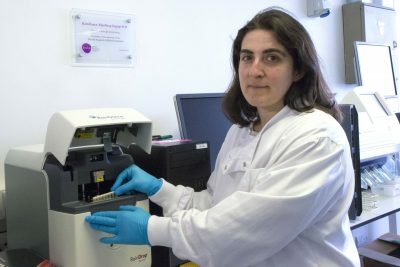 Mary Alikian is a research associate at the Molecular Pathology Laboratories in Imperial’s Department of Medicine.